As all established travel bloggers will tell you, we receive a lot of awards. Awards for the whitest website. Awards for having the website with the cleanest language. Awards for the most amount of exclamation marks used to tell the world you won an award!!!!!!! I usually chuckle, then delete them and continue eating my mouse mat, but this one’s been bugging me. 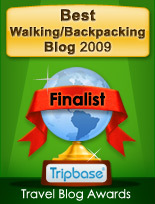 I recently received an email congratulating me on being a finalist in the Walking/Backpacking Blogs category for the website, TripBase.com. What followed was an awkward cyber-silence that gnawed away at me, until I realised every man and his blog seemed to be milking the obscure glory. So, here it is. TrailofAnts.com, this well established budget backpacking website is overwhelmingly proud, no speechless, really, to have become a recent finalist in the hiking category for the observant, and persistent TripBase.com. Now, here’s the real kicker. TripBase.com is actually quite a neat idea for a website. Sure, it has its critics but I respect the work that’s gone into it. But. I just hate being used to promote services, and I reckon this one has backfired on them. To conclude; If you’re new to TrailofAnts.com, you should know that I loathe hiking so much that I once separated myself from two of my best friends and my quasi-girlfriend because I had not an inkling to join them on a grueling three week hike around Nepal’s Annapurna Circuit. Obviously – gush – I do, umm, y’know, put a lot of work into TrailofAnts.com and if, well, y’know, if any of the more credible judging panels want to nibble on my work, then go right ahead. Was I too harsh? Is it wrong to look a gift horse in the mouth? Have you received an non-award you’d like to share with us? My blog once got selected as a finalist in a Dutch travel blog contest – turned out the final winner was to be decided by sending costly text messages – cheecky bastards. Maybe there should be an award for the best non-award?